Seven, it seems, is the magic number in the PC realm right now. Not only has Microsoft's latest operating system been baptised with the numeric title, but Intel's Core i7 is the processor du jour. It's making me wonder if there's a Dan Brown-style conspiracy afoot, and whether as soon as we add a graphics card with 'seven' in its name to this PC, a mystical vortex to another world will open up. PC Specialist has, regrettably, missed the mystical power conjunction the 'seven' opportunity offers its new machine, but it has entitled it 'Vortex' – maybe as some kind of conspiracy-theorist-enticing hint at the unlockable dimension gate within. And as far as combinations go, the Vortex i950's is pretty much unbeatable, and comes complete with a decent Core i7, a GTX295 and 12GB RAM for less than £2,000. Win. 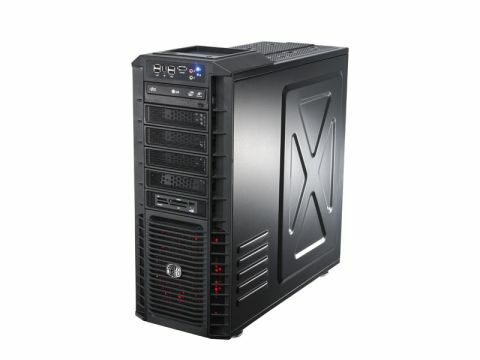 It's somewhat surprising that PC Specialist has managed to bring its PC in at such a low price considering the graphics card, memory and CPU alone combine to about £1,000. When that's added to a quality case with liquid cooling and 1.5TB of storage, it's hard to see how PC Specialist is making any proﬁt at all. The Vortex i950 didn't let us down in our tests, either. The 950 is a powerful little chip and we could certainly see the difference it made over the de-facto – albeit cheaper – Core i7 920. It was the increase in video encoding that most impressed here. The choice of graphics card handled everything we threw at it with aplomb. We hooked the PC up to a 30-inch monitor and it didn't drop a single frame, even at the highest resolution in the world. In fact, the only slightly dodgy point we could ﬁnd was that the graphics card made a lot of Spectrum-cassette loading-esque noises when benchmarking games, but we're guessing that these sounds were only audible due to the near-silent operation of the PC itself. Compared with other Core i7-based PCs we've looked at, the PC Specialist system sits exactly where we'd expect it to in terms of price and performance: above the 920s, but below some 965-based behemoths. This system is half the price of some high end machines and it certainly delivers more than half the performance. If you've got the cash to hand, it's certainly worth considering the PC Specialist option. It would probably cost you about as much to hand-build a similarly speciﬁed system, and our benchmarks speak for themselves. We're still in shock at just how robust this system is and how well it performed in our tests.